Banana Island is an artificial island in Lagos State, Nigeria. It is located in the Lagos Lagoon and attached to the North-Eastern Ikoyi Island by a dedicated road strip which is linked to the existing road network. If you never heard about the Island, now you know. Banana Island is Nigeria’s most extravagant and expensive neighborhood – on par with the Seventh Arrondissement in Paris, La Jolla in San Diego, California and Tokyo’s Shibuya or Roppongi neighborhoods. The exclusive playground of Nigeria’s obscenely wealthy, Banana Island is an artificial island built on reclaimed land in Ikoyi-Lagos. From an aerial view, the island is actually shaped like a banana, hence its name. Sitting on 1.6 million square meters, the sumptuous island is divided into about 535 plots ranging in size from 1,000 square meters and 3,000 square meters. Banana Island is a place of unrivalled opulence and grandeur. It’s an entirely different world from other parts of the country. It’s a gated community, and its inhabitants enjoy such luxuries as underground electrical systems and water supply networks, 24 hour-electricity supply (the only other place such privileged is the Nigerian President’s residence), extremely tight security, good road layout, a central sewage system and treatment plant and the well-cherished company of fellow wealthy folks. 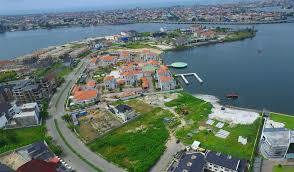 The island is the most expensive place in Nigeria and one of the most expensive in Africa to own a house. Property on Banana Island is dollar-denominated. The average cost of buying a three bedroom apartment is $2 million. However, if you’re just looking to hang around the island for some time, and not to buy property, you can rent the same apartment for about $150,000 per annum. But there’s a clause: you must pay for an initial minimum term of 2 years – in advance. And there are no refunds. Ever! Also, the tenant is also mandated to pay a ‘service charge’ of $17,000 per annum. A typical plot of land on the island usually goes for between $4 million and $6 million, and the cheapest building on the island costs upward of $8 million. But because of the ridiculous prices of property on the island, about 60% of the completed buildings are currently unoccupied.